A good Hamster Muesli will contain all of the nutrients and vitamins that your hamster needs for a healthy balanced diet. A good Muesli will contain around 19% protein, so Supreme Harry Hamster is a popular choice. You can feed your pet every 3 days or so, but remember that your hamster will store food, so check nesting areas for a stock pile before filling up an empty food bowl, or you may end up throwing food away! You can supplement a muesli diet with treats. Treats should be given sparingly, and never introduce more than one new food type at a time, or you could risk causing stomach upsets and loose stools for your pets. This has been known to be fatal. Always give treats in tiny portions. A good choice of treat is a puppy biscuit, your hamster will enjoy the taste plus the crunchy biscuit is source of calcium, and good for gnawing on and keeping teeth trim. Always choose a milk bone like Purina Bonio Milk Bones for Puppies. These biscuits are safe for Syrian and Dwarf hamsters. Hamster Chocolate Drops and Fruit snacks are a good choice, but no more than 1 per day - but do not feed these to dwarf hamsters, as they are at risk of diabetes. Hamsters will also enjoy tiny amounts of cooked pasta, plain cooked chicken, cooked broccoli, cooked carrots, plain cheddar cheese, cucumber and plain scrambled egg. Never feed your hamster garlic, onion, leek, potato, tomato or chocolate. For a complete list of safe and unsafe food, please visit Hamster Fanatic Forum. Hamsters will usually stay active and lively throughout their lives. However, as with all animals, they may get ill or injured and require veterinary treatment, and just because your pet cost you less than £10 to purchase, this does not mean you deny it medical care and as with all pets, you are responsible for your hamster's well being. To ensure the care and keep of your pet, as mentioned above, provide a balanced diet, provide social interaction and care, and provide opportunities to exercise. This includes an appropriate sized exercise ball (if favoured by your pet) and a suitable wheel. Many hamsters will chew the cage, the ball, toys and so on, and inadvertently break or snap teeth. This is more common in older hamsters, but not unknown in youngsters. In most cases, your pet will instinctively gnaw until the teeth are even. However, in some cases the hamster is unable to even out the teeth themselves, and will require a trip to the vet (or vet nurse) for a quick trim. If you ignore the problem, it may prevent your hamster from eating, or the tooth will continue to grow into the hamsters mouth, both can be avoided by taking your pet to the vet. Cushings disease is a genetic and hereditory illness in hamsters (as well as cats and dogs). At present, treatment for hamsters is in the early stage, although cures do exist for other animals. A vet can diagnose cushings with a skin scraping, so they can analyse the cells. A hamster with cushings will start to lose its fur, usually on the legs and sides first, ending with the head last of all. The hamster's skin may look sore, red and flakey. You can apply some E45 cream on the dry skin to make it more comfortable for the hamster. You should also remove any sharp objects from the cage, as the exposed skin is prone to cuts, scrapes and infection. Your hamster will remain active with a good appetite for awhile once cushings sets in, you should spoil your pet during this time, providing treats, cuddles and lots of attention. It is important that you do not change your manners with your hamster, it may be bald and not as cute anymore through human eyes, but your hamster will not understand this. All it will understand is that you don't love it anymore, causing anxiety and depression during what is already a difficult time for the hamster. So make sure that your hamster still has TLC from you, it will help. When your pet shows signs of being more lethargic, inactive and loss of appetite, it could indicate that the end is near and you may want to take your pet to the vet for expert medical opinion. Hamsters can catch the common cold from human interaction. It will display similar symptoms too, including runny nose, watery eyes, sneezing and being lethargic. In some cases, a common cold can be fatal in a hamster. If you have a cold, ask someone else to tend to your hamster whilst you are recovering. If you must attend your hamster whilst you have a cold, keep contact to a minimum and wash your hands and arms thoroughly. If your hamster does catch a cold, give them time to recover before putting them in a ball or other exercise, keep them warm with lots of extra bedding, make sure they are not in a drafty area. Give them food and regular fresh water, make sure it is within easy reach (if you have a multilevel cage, you may want to bring these things to the level where your hamster is sleeping). Diabetes is very common in dwarf hamsters (hybrids) Winter White and Campbells dwarf varieties. Symptoms of diabetes include enhanced thirst and consumption of water, excess urination, a sweet smell and uncharacteristic behaviour. For example, a placid hamster may become aggressive or nippy. You can take your hamster to the vet if you suspect diabetes, or buy over-the-counter test strips, called Diastix, to dip in your hamsters pee. You can buy these from Boots and all good pharmacies. It is important to avoid giving a diabetic hamster any sugary food, so do not feed them any fresh fruit, hamster chocolate or yoghurt drops, or treat sticks, such as honey sticks, as these are all too high in sugar. Instead, feed them tiny bits of plain cheddar cheese or cooked broccoli as a treat. Syrians, Chinese and Roborovski hamsters are not as prone to diabetes, but similar steps should be taken if suspect diabetes in these species. Occasionally, a hamster will over-fill their pouches, or a sharp piece of food or a toy may pierce the pouch. Your hamster's face will swell and they may be unable to eat. Take your hamster to the vet, the vet will check the pouch, ensure no sharp food is lodged and will most likely inject the hamster with pain killers, anti-inflammatory medication and perhaps a dose of Baytril (antibiotic) in case of infection. The vet will probably prescribe (depending on severity of injury), a week's course of anti-inflammatory drugs to administer at home. The easiest way to do this is to hide it in food, such as a tasty treat, or warm meal like porridge. Mites can be passed from animal to animal and often arrive in the house from woodflakes or food. There are 2 main types of mites. The first are visible on the surface of the skin, and you can see them crawling on your pet. The second type is 'dermodex' and can only be seen under a microscope. Mites will cause your hamster to scratch, lose fur and may cause flakey, dry skin (E45 cream can be applied in this case). It is important to take your hamster to the vet, who will treat with a strong parasite medication, just a tiny drop between the shoulder blades of your hamster. Treatment may take a few visits (but you will only usually be charged the consultation fee on the first visit, after that, you will only pay for the medication, (about £2 - £5 per visit). Over-the-counter treatments available in petshops are rarely as effective, and do not take in to consideration the size and weight of your pet (especially dwarf hamsters, who may even die as a result of overdose). After your pet has been treated by the vet, throw away any bedding, woodflakes and food you may have and buy new, wash any toys thoroughly with pet safe disinfectant and clean the cage with boiling water and pet-safe disinfectant. There is no point taking your hamster to the vet if you put them straight back into a mite infested cage. Sadly, some hamsters may experience neurological disorders, this is most common in dwarf hamsters. A hamster may pace constantly, or spin on the spot, unable to stop. In these cases it is important to put your pet in a quiet spot where they will be disturbed as little as possible. In these cases, the hamster will often starve as they cannot stop pacing/spinning in order to eat or rest. Therefore make food and water as accessible as possible. Sadly there is no known cure, so give a suffering hamster the best possible quality of life. Hamsters may be prone to tumours and cysts. These can appear anywhere on the body and seeking the advice of a qualified vet is the first course of action. A slow growing, flexible (not attached to the bone) lump may indicate a cyst, and the vet may be able to drain it, and treat the hamster with a course of antibiotics. Others lumps may be cancerous and your vet will be able to take a sample to test for this. In some cases, lumps may be surgically removed successfully. Hamster's can and do make a full recovery from surgery, although due to their small size, undergoing full anaesthetic will carry some risk. A vet will advise based on a hamster's age and overall condition. Some lumps may grow internally, and are therefore not instantly visible. It is advisable to gently feel your hamster's body for any unnatural lumps and bumps. Hamsters can develop tumours in the brain, in this case, watch for a change of behaviour and for any pressure behind your hamster's eyes. For example, do the eyes appear to bulge more than normal? has your hamster's activity levels changed? Always seek the advice of a vet. Unfortunately, tumours and cysts are quire common in hamsters. Hamsters may experience diarrhoea from time to time. This is fairly common in very young Syrian hamsters when first purchased. The stress of leaving the pet shop and finding themselves in a new home is sometimes too much, and as a result, hamster stools become loose and runny. This can also happen if you switch a hamsters diet, or introduce new foods in too larger quantities or varieties. This not very common in dwarf and chinese hamsters. When a hamster has loose stools, it is vital to keep them hydrated, ensure water is accessible and fresh, you may have to offer your hamster water if they are too weak to get to the bottle. You could also try and introduce small amounts of hydrating food such as cucumber (without the skin). It is important to see a vet as soon as possible, in most cases the hamster will require a course of antibiotics, and may even be injected with fluids. If a hamster has diarrhoea keep them warm and away from direct sunlight or drafty areas. Wet Tail is different to diarrhoea, although the symptoms and treatments are the same. Wet Tail is a stress-related illness caused by the upset of bacteria in the gut. Speed is of the essence and a suffering hamster will require antibiotics. You can also supplement the treatment by providing plain pro-biotic yoghurt, or pro-biotic powder in the hamster's water,however, leave it 5-6 hours after administering the antibiotic for it to be effective. Syrian, Dwarf and Chinese hamsters may get over grown claws from time to time. Keep an eye on your pet's paws, and if you see an overgrown nail, or nails that are curling, then book your pet an appointment at the vet. In most cases, you will not need to see a vet, as a nurse can quickly trim the claws with pet nail clippers. 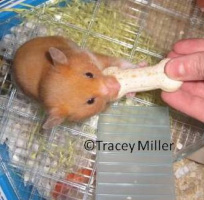 To keep claws trim, you could provide a terracotta tile in the cage, place it somewhere that your hamster can't avoid it, such as by a food dish, toy or water bottle. You could give them terracotta dishes etc to climb on. Syrian, Dwarf and Chinese hamsters may experience sprained or broken bones. This is usually a result of a fall, (please see the section on appropiate cages for Syrian and Dwarf/Chinese hamsters). If you suspect a sprain or fracture, take your pet to the vet for diagnoses. A hamster with this type of injury may need anti-inflammatory medicine before the vet is able to feel the swollen area effectively, and assess for breaks. Pain killers may also be required. It is important to enforce a period of cage rest, take away any climbing toys and wheel, your hamster may be bored, but at least it will be resting the injury! if a hamster does break a limb, some vets will make a splint and bind the limb, others won't, and will continue with anti-inflammatory/pain killers as treatment. In some cases, a hamster may need amputation, in this case, follow the advise of your vet. Hamsters do cope very well on 3 legs, and most will not be affected or experience a reduced quality of life.